Do you need to go from Bishkek to Almaty quickly and cheaply? 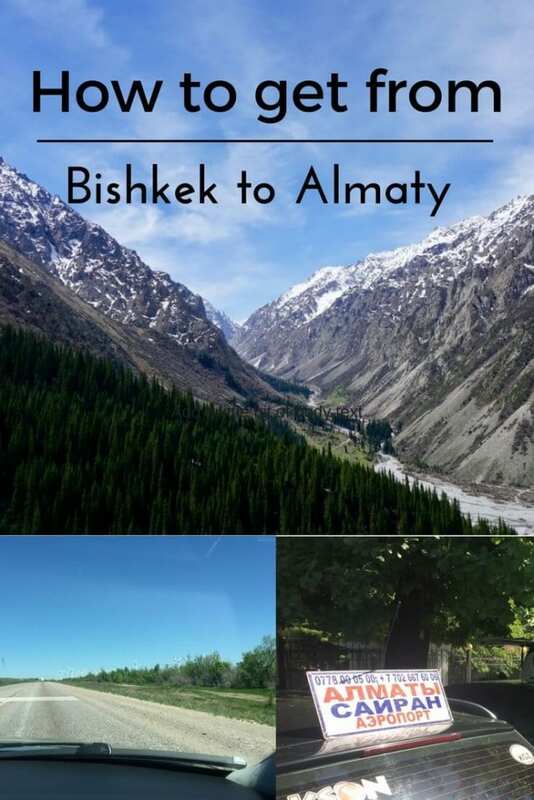 Just follow this guide on how to go between Bishek and Almaty via bus or taxi. You can easily travel between Kyrgyzstan’s capital Bishkek to Almaty, Kazakhstan in just 4-5 hours across very good roads for less than $10. This short guide includes everything you need to know to go from Bishkek to Almaty quickly and affordably. There’s a lot of info in here and, since you’re likely to lose internet connection during your trip from Bishkek to Almaty, be sure to save this guide offline for later! Just enter your email to join my newsletter and I’ll send it right over. Why Travel from Bishkek to Almaty (or vice versa)? Bishkek offers access to incredible day hikes in Ala Archa National Park and is the gateway to beautiful Kyrgyzstan — one of the world’s great off-the-radar travel destinations. Visiting Almaty brings you to a cosmopolitan city nestled at the base of some stunning mountains, with an incredible cafe culture (check out my list of the best cafes in Almaty) and vibrant social scene. Its airport is also the best gateway for any Silk Road adventure, with daily flights to Europe, the Middle East, and all around Asia. Both Kyrgyzstan and Kazakhstan are now visa-free for many nationalities! There are basically four main options for travel from Bishkek to Almaty: minibus, shared taxi, drive yourself, or via a flight. The minibus is the more direct option, as it will drop you at the station in central Almaty. Second, you can also get between Bishkek and Almaty is by taking advantage of the local marshrutkas, which are shared taxis that ply the dusty roads all over Kyrgyzstan. These are parked along the road just to the east of the Western Bus Station. I took a marshrutka, but it required waiting almost an hour for it to fill up with three other passengers. 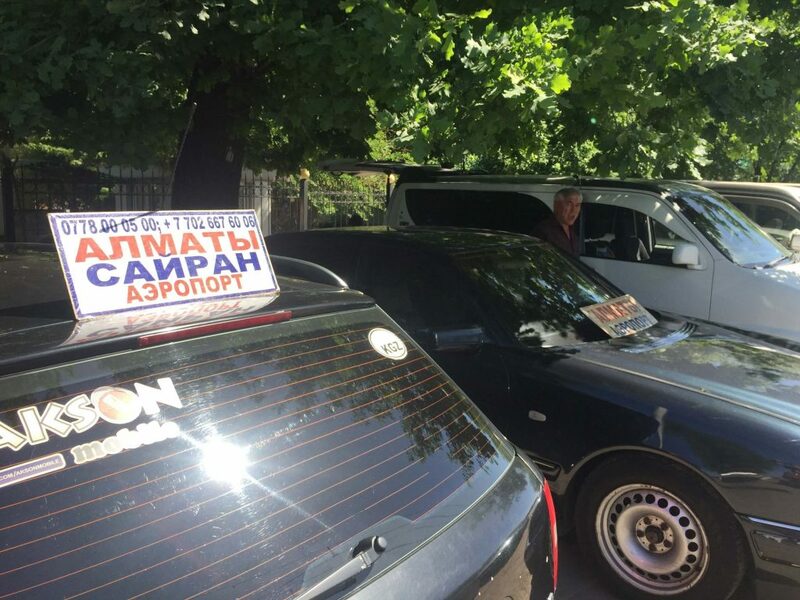 Again, look for a driver or car with the sign “Алматы.” And if you are pressed for time or want a private car, you can always buy up the other seats so that the taxi leaves immediately. The cost should also be around 700 Som. My driver talked (well, he spoke no English, so more like “hand-signaled”) me into paying 1000 Som for a “direct” transfer to my Almaty hostel, though it ended up not being so direct (see below) and I think I was taken for the extra 300 Som. 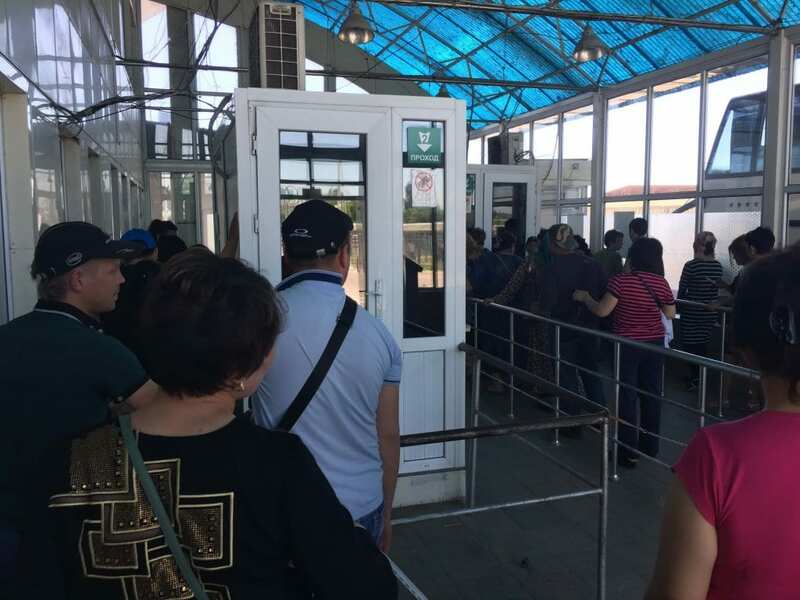 Make sure that your driver will go through to Almaty, and not just to the Kazakhstan border (though note that in a worse case scenario, if you get abandoned at the border, there are lots of marshrutkas waiting on the Kazakh side willing to take passengers on to Almaty). Though it may take a bit longer than a minibus, the marshrutka trip can be an interesting cultural experience. The three Kyrgyz women sharing my car were going to Almaty to do some shopping and, though we each only spoke a dozen words of each other’s language, I greatly enjoyed the ride with them. If you have your own wheels, the drive from Bishkek to Almaty is actually pretty straightforward. 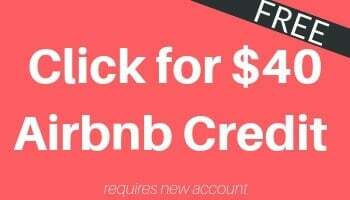 Unless you own the vehicle, the most difficult part is likely going to be finding a car rental company that will allow you to take the vehicle across the border. But the drive itself is simple: Just follow A-2 to the Korday border crossing, then keep following the signs through to Almaty (Алматы). Be sure to read up on driving in Kazakhstan to make sure you’re prepared. If you’re really in a rush, Air Astana offers a daily flight that leaves at 8:15 from Bishkek’s airport (code: FRU) to Almaty (code: ALA). You can price out that flight here. Flights seem to typically be priced in the $60-80 range. Personally, I’m not sure the option will save you THAT much time by the time you factor in the trip to and from the airports. But it’s also not that expensive, so if you’re in a hurry or just hate drives, this is definitely an option. The border lies just 25 minutes north of Bishkek. You will be required to take your luggage with you. Your driver will go through the border separately and should meet you on the other side. Be sure you remember the car you are in (perhaps take a photo of the license plate), as there are a lot of similar looking cars waiting on the other side. First, you must clear immigration on the Kyrgyzstan side — assuming you are a foreigner, go to the line on the left side. After getting your exit stamp, you will have to walk 200 meters over a bridge to Kazakhstan. On the Kazakh side, you will need to get a small and very simple entry form from a guard (note that many of the people there are locals who will be skipping this step). Fill this out, then get in any of the lines for entry to Kazakhstan. Since both countries are now visa free for US citizens, the process was very simple. I was across the border in under fifteen minutes. Once you clear immigration, you’ll exit the other side of the bridge where you will likely be approached by many drivers look to sell onward rides. Ignore them and, if you do not yet see your driver, continue towards the gas station, where there is a small seating area for you to wait for your driver. If you want to exchange money, there is a small exchange counter near the gas station. The onward drive to Almaty takes you through largely barren steppe, although there are some pretty windmills and views of the mountains along the way. After about 2 1/2 to 3 hours, you should arrive on the edges of Amalty, where traffic begins to get busy at rush hour. If you have taken the minibus option, it should take you straight into the center, where you will be dropped off and can grab a taxi or Uber (very cheap and easy in Almaty) to your final destination. If you have taken a marshrutka, it can get a bit tricky here. After dropping off my taxi-mates at a shopping center, my driver pulled over on the highway, grabbed my bag and told me to get out of the taxi. I was a little rattled when he pulled over a random car and told me to get in! Thankfully, the driver of this car spoke some English and explained the situation: in Almaty it is very common for private cars to act as unofficial taxis. Rather than bear through the rough traffic to the city center (and back out on the way to Bishkek), many marshrutka drivers will just send you in one of these make-shift taxis. My driver paid a few hundred Tenge ($.70) to the new driver, meaning I lost out on a couple dollars by paying for the “full transfer” to Almaty. The new driver was thrilled to meet someone with whom he could practice English, as was the elderly lady we picked up on the way. Although English is much more prevalent in Almaty than in Bishkek, it might be a good idea to have your destination written out in Russian (or have the number for your hotel/hostel) in case the new driver does not speak English. Getting from Bishkek to Almaty is easy, safe, quick, and affordable. The minibus is probably the easier option, though I found the shared taxi to be an interesting experience. Oh, one last time: since you’re likely to lose internet connection during your trip from Bishkek to Almaty, be sure to save this guide offline for later! Just enter your email to join my newsletter and I’ll send it right over. Also, get a free Lonely Planet Guidebook to Central Asia using this trick! Plus, learn what to pack for your trip. 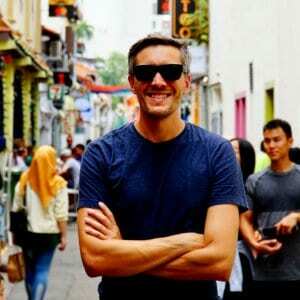 Lastly, if you are a frequent traveler, be sure to check out my list of 20+ AWESOME Resources for Every Traveler. It’s one page with all the travel sites I use to book my own travel!